Ya know what's happenin' right now in Glendale, Arizona? Fantasy camp... And hangin' out with the fantasy ballplayers is the above motley crew of former Dodger players. Pic above via @TommyLasorda on twitter. 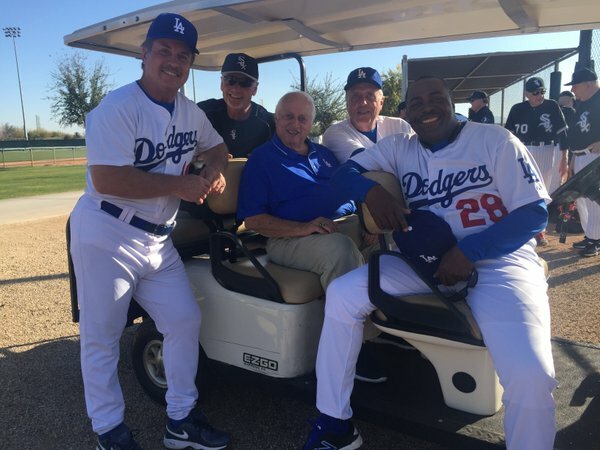 BTW, Jon Weisman at Dodger Insider wrote a great piece about the current fantasy camp happenings that you can check out right here. He doesn't turn 20 until August, and he's already knocking on the door. Urias has an outstanding combination of stuff and pitchability well beyond his years. He has three plus pitches with outstanding command. The only thing he doesn't have is innings. Urias has yet to top even 90 innings in a season, but that shouldn't hold him back for too long. Via Amanda Howell at Dodgers Way, "Alanna Rizzo Celebrates Two Years with the Dodgers." Via Daniel Starkand at Dodger Blue, "Clayton Kershaw Prefers To Keep DH Out Of National League." Jeff Pearlman recently wrote about the power of Baseball cards here. There’s a 1980 Youngblood, for example, that’s all creased up. As soon as I saw it, I remembered finding it on the Lakeview Elementary blacktop and sticking it in my pocket. Only I didn’t merely remember. I felt it. Like, the emotions and texture of 8-year-old Jeffrey Pearlman hit me. Only for a second. But I felt it. I did. Via Ron Cervneka at Think Blue LA, "‘Lemonade Guy’ as big a part of spring training as the games." Moore is one of several lemonade vendors at the Cactus League’s most beautiful ballpark and it should come as no surprise that he was recently voted the best vendor in Major League Baseball by fans. His schtick is a simple one and it tugs at the hearts of baseball fans from across the country – “Lemonade! Lemonade! Just like grandma made!” – and it works.